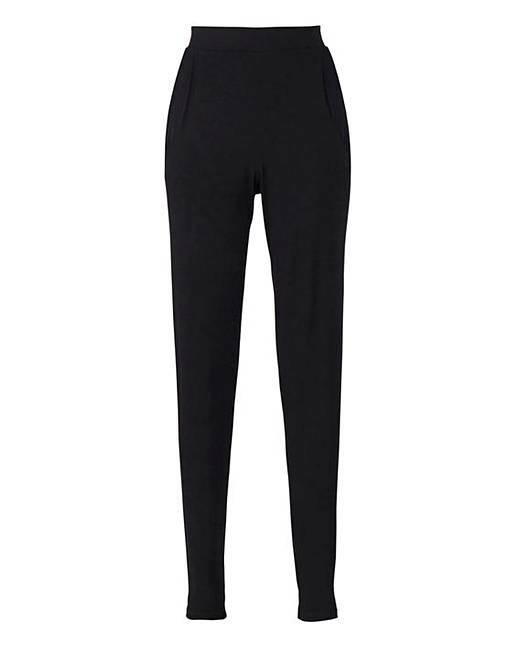 Stretch Jersey Tapered Trousers is rated 4.4 out of 5 by 23. Flattering easy-care stretch jersey fabric with pocket detail. Tapered leg shape, looks great with flats or heels. Rated 4 out of 5 by Nat2003 from Very comfy I have a few pairs of these, very comfy and the fit is great only down side is after a few washes they lose there colour. I have black and always turn brown. Rated 5 out of 5 by Snuggles from Best thing since sliced bread!! Have lots of pairs of these. 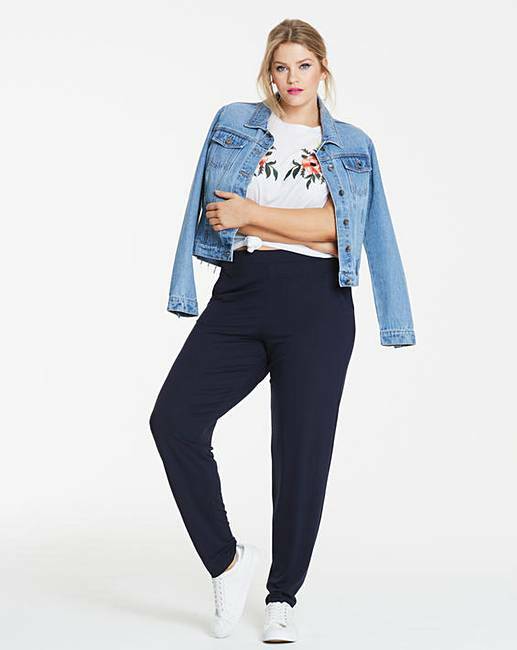 Comfy, casual but can also be dressed up if required. Great for work. Rated 3 out of 5 by Miss Jem from Not for me I like the thought of these but when on they just didn't flatter my body type which is more of an apple shape.They came up big as well so definitely err on the side of ordering a smaller size. If in the sale I might order a smaller size and be daring and try them as they were supremely comfortable but I just wasn't convinced on this occasion! Rated 5 out of 5 by Weeny from Very comfortable Very pleased with purchase, will definitely be ordering more in future. Good value for money. Rated 2 out of 5 by LindaAnn from Lovely flattering drape I Love the design and cut of these trousers but unfortunately I dont like the material. They have 'kneed' already despite only wearing them twice and also a hole has appeared on one of the legs. For the price paid they are Not good value. Rated 5 out of 5 by Owen68 from Lovely Comfy Trousers Bought these for the wife for work. Lovely and comfortable and wash very well. Rated 5 out of 5 by WendyT from Really comfy and wash well Initially ordered these for travelling on holiday but had to wait for stock. Wish I had received them before travelling as they are so comfortable and wash really well. Have also ordered these in black and am waiting for them to come back into stock. Not surprised they are currently out of stock as I'm sure they are very popular. Rated 5 out of 5 by None from Just right The go to trousers, any occasion with any type of top easy to dress up.